My dark past (Tweezers! Piercings!) turned my already flawed brows into a hopeless mess. Until I discovered a makeup alternative. My eyebrows have always been crummy. I have thick, coarse hairs, but very few. Specifically three hairs that I could style this way or that, like Donald Trump comb-over brows. 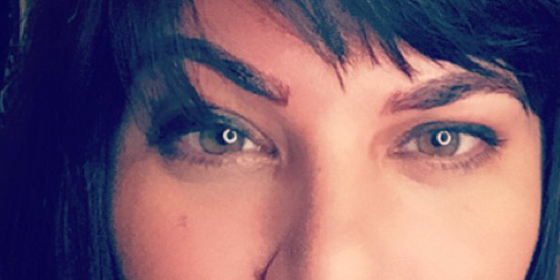 I made them worse by over-plucking in the ’90s when pencil-thin brows were popular. Plus, I have a scar from an eyebrow ring accident in college. I was at a Dixie Chicks concert and a lady’s sweater caught on the piercing, ripping it clean through the skin. Now I have a divot where hair won’t grow. 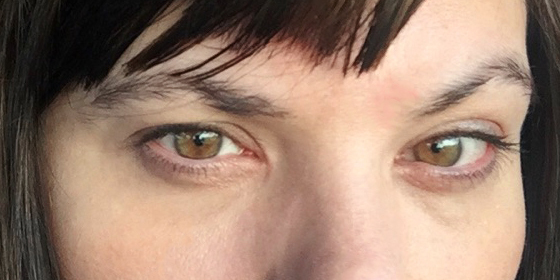 I’ve purposely kept bangs to cover my eyebrows, but now it’s like they’re supposed to be your best feature. Everybody is studying everybody’s eyebrows. A friend who knew about my brow issues told me about Claria Renee Beauty and her microblading procedure, essentially a semi-permanent tattoo for eyebrows. Claria has a huge following. I watched every one of her eyebrow transformation videos on Instagram. Here’s how it works: you lie back in a chair, and she asks you what you don’t like about your eyebrows. Then she starts by triangulating where your eyebrows should be, measuring from different points of your face, and roughs them out with a marker so you can tell her if you like the shape. You can also customize the intensity. I asked to start out very faint because I was afraid I was going to leave with massive Groucho Marx brows. Then she rubs on lidocaine, a numbing agent. The bone is a little bit closer right around the arch of your eye, and that’s where it starts to hurt. You’re not going to cry. It’s just uncomfortable—especially because you know she’s slicing your eyebrow with what is essentially an X-ACTO knife loaded with ink. She makes lots of tiny cuts, laying the ink lightly under your skin to make it look like fine hairs. This process takes about 45 minutes. If you’re on the fence, try a brow tint first. That will give you an idea of what living with a bolder brow is like. Be sure to look at an artist’s healed work, not just freshly finished brows. An artist who hasn’t been properly trained might go too deep and it won’t look as crisp after a few weeks. Remember: you can always add, but you can’t take away. The pigment won’t change color over time; it will just fade. I recommend going in for a touch-up after a year, which costs less ($350) than the full thing ($550). Check out Claria’s work on Instagram: @claria_renee. Your microbladed brows are going to be darker when you’re first done. Don’t worry. They will tone down and become more natural. You have to keep applying Aquaphor healing ointment and you can’t work out or wear makeup around them to keep them clean for a couple weeks. In the meantime, you’ll just have dark, shiny eyebrows. I covered them up with my bangs and wore really big sunglasses. In the end, it looks much more real than makeup or traditional tattooing. It was worth every bit of the $550 Claria charged for the initial visit plus follow-up. And it’s not a commitment because it fades after a year or two. A good thing in case today’s Cara Delevingne eyebrow trend is replaced—fingers crossed—by the triple-hair comb-over in the future.